Dynamics 365 Enterprise Edition is the hottest of version of the good old Dynamics AX, which is present in the Cloud, or in a Hybrid model offering the firms the much needed flexibility to do business from a varied range of devices. Users can manage operations on dynamics solution at any time of the day, as long as they have an active WI-FI connection. Microsoft Dynamics 365 Enterprise Edition includes, Dynamics 365 for Operations, PowerBI, Azure IoT Suite, Adobe Marketing Suite, Cortana and the Power Apps & Flow. However, In case you require an on premise program, the incorporation of the Azure platform’s linked apps will not work without the data being stored in cloud. The ERP world as we know is transforming quite rapidly, because of the cloud implementations as there are huge differences in integrating in the cloud as opposed to on premise. The new version of Dynamics 365 for Operations, which is also known as the ERP solution, can be easily purchased as a separate solution for more than 20 users in a public cloud. The software will be provided as a hybrid solution and as well as an on premise tool. Dynamics 365 for operations which is also referred as Dynamics AX 7 is a revolutionary ERP solution. The users can use it anytime, anywhere, and on any device, plus, it also contains decent amount of development space. Microsoft Dynamics 365, which is basically a cloud-based solution experience centered on a mutual data model enables the Microsoft’s existing CRM and ERP cloud programs to be deployed in a single cloud service along with new subscriptions based in the roles. Microsoft Dynamics 365 programs are devised so they can be smoothly and autonomously deployed. The organization can easily initiate the operations by using applications you require, and as the business demands more, you can adopt supplementary capabilities with equal ease as all the applications that work together. The purpose-centric apps help to handle all the dedicated business operations including, customer service, and field service as well as project service automation. 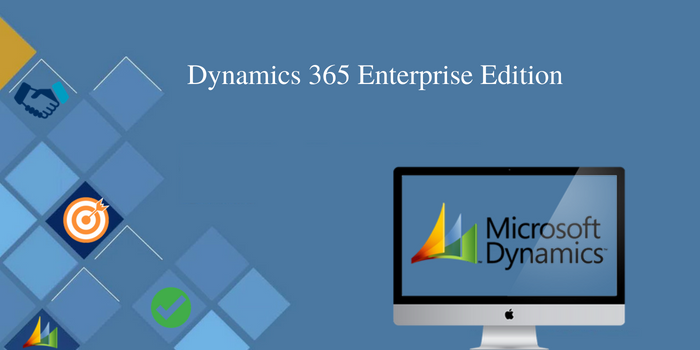 Microsoft Dynamics 365 can be opted for in various different ways including: Dynamics 365 Enterprise Edition or the Dynamics 365 Business Edition. Dynamics 365 Enterprise Plan 2 is the one which should be purchased if you want the ERP features as well. Microsoft Dynamics AX (7) is included as Operations in the Microsoft Dynamics 365 Enterprise Edition. There some differences between Dynamics AX and Dynamics 365 enterprise edition as well. Licensing is more flexible when it comes to buying the Dynamics 365 Enterprise Edition. Also, plans which are present in the Microsoft Dynamics 365 are present in two ways: generally as Plan One and Plan Two. Dynamics 365 has become a blended family and the latest new Office 365 portal client replicates that. Extremely clean navigation, smooth layout of fields as well as the eradication of the extra white-space are a few changes in the interface. Apart from these, the mega change remains a responsive and similar UI for all the platforms and devices like Mobile and Tablets, Desktop, Customer Service Hub, as well as the Business Edition apps etc. If you know about the Interactive Service Hub, then this addition in the new Dynamics 365 will feel somewhat familiar. The new attribute will collaborate Posts, Activities, as well as the notes into one feed. The user will also be able to refine particular activity kinds and rapidly see unread items. The cutting-edge Unified Client Interface appears to be pretty awesome, but the web-client also offers a remarkably fresh look. A few of the key highlights include: uniform spacing, borders around containers, added color theming, improved field controls styling, better font standardization etc. Virtual Entities are same as the customary entries that we do. Though, the external data is read at the run-time, and it is not at all stored in the database of the Dynamics 365 database. This is a fabulously new feature for hefty, custom integrations. This allows the user to create a business-owned entity, verify the metadata box to specify that it is virtual. Both Microsoft Dynamics CRM and ERP are fantastic products offered by Microsoft. But, now the integration of both in the Dynamics 365 has made the offering all more preferred and useful for the firms. Ethan Millar is a technical writer at Aegis Softtech especially for computer programming like Asp.net, Java, Big Data, Hadoop, Microsoft Dynamics AX and CRM since more than 8 years. Also, have basic knowledge of Computer Programming.